Confused by all the strange coffee terminology you come across when researching a new coffee maker or when ordering at the local coffee shop? We get it –there is a whole lot of coffee jargon you may never have heard before. 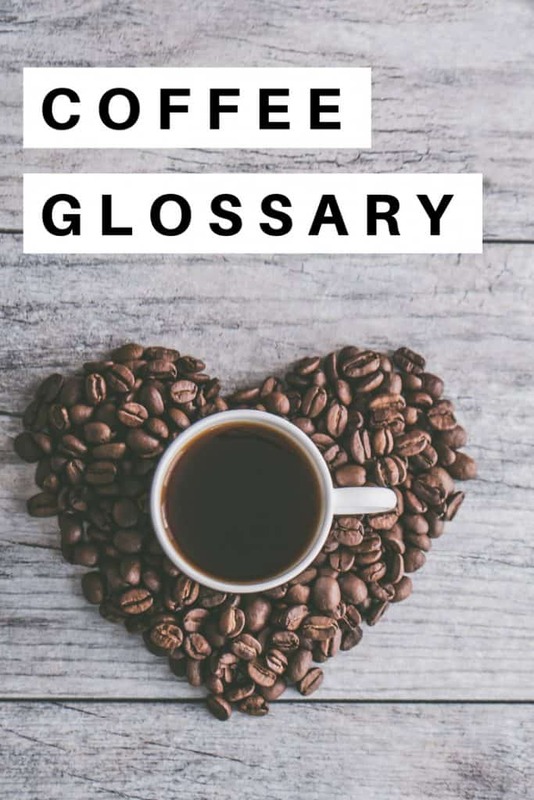 Here we share some of the most common coffee terms and definitions you might come across when researching espresso machines, coffee beans and when reading the menu at the local cafe. Acidity: The tartness, brightness or liveliness perceived on the palate when drinking coffee. Along with body and aroma they make up the three essential components on which coffee is evaluated and categorised. Aeropress: A device for manually brewing coffee. Coffee is steeped in hot water before the plunger is pressed through a filtered tube. Affogato: An espresso shot poured over a scoop of vanilla icecream. Americano: A single shot of espresso topped up with hot water. Known in Italy as a Caffé Lungo. Arabica: A species of coffee tree that accounts for 70% of the world’s coffee. Aroma: The fragrance produced by freshly brewed coffee. Barista: Italian term for a skilled coffee making professional. Blade grinder: Machine that uses propeller like blades to grind coffee. Considered inferior to a Burr Grinder. Blend: A mix of two or more single origin coffee beans. Boiler: Heating element used to heat water in espresso machines. All water in the boiler is heated to temperature before use. Espresso machines may have a single or double boiler. A double boiler has one boiler to heat steam and another to heat water. Body: The impression of the weight of the coffee in your mouth. Ranges from thin to medium to full. Burr Grinder: Machine that uses two adjustable revolving surfaces (burrs) in between which coffee beans are ground. Considered far superior to a blade grinder. Caffeine: Natural compound found in coffee that is a stimulant to your nervous system. Cappuccino: Style of coffee made up of 1/3 espresso (2oz), 1/3 steamed milk (2oz), 1/3 microfoam (2oz). Often topped with chocolate powder. Coffee pod: term for individual serves of coffee pre-prepared in small capsules for use in single-serve coffee machines. Cortado: Style of coffee made with a single shot of espresso and a small amount of steamed milk. Crema: The essence of espresso. The thick, caramel coloured foam that sit on top of a shot of espresso. Dark Roast: Almost black beans with high levels of oil on the surface. Thinner flavour, higher bitterness, low acidity. Decaffeinated coffee: Coffee with at least 97% of caffeine removed. Demitasse: French word meaning a small coffee cup. Used to serve an espresso or macchiato. Doppio: Double shot of espresso with a small dash of hot water. Drip Coffee: A style of coffee where the flavour comes from the beans coming in contact with water not under pressure. Perculators, countertop coffee makers and filters fit in this category. E.S.E. pods: Easy Serving Espresso pods are small packed pre-ground coffee pods encased in a paper filter. Created by Illy in the 1970s they are considered a more environmentally friendly pod than the Nespresso and Keurig coffee pods. Espresso: Coffee brewed by forcing hot water at pressure through fine ground beans. Invented early in the 20th century in Italy. Extraction: The brewing process whereby flavour is drawn from the coffee grounds. Filter basket: A metal round container with a perforated floor in which ground coffee is placed and tamped for preparing espresso. Can be dual walled (pressurised) or single walled (non-pressurised). Filter Coffee: Any style of coffee where water filters through ground coffee. Drip coffee made with a cone lined with paper is a commonly known type of filter coffee. Flat white: A style of coffee made with espresso and topped with flat steamed milk to a total size of 5-7oz. Less milk than a latte. Less foam than a cappuccino. Flavour: The flavour of coffee is the combination of aroma, acidity and body. French Press: Coffee made by steeping ground coffee in hot water in a (usually) glass cylinder. A strainer plate is pushed down once extracted to separate the grounds from the coffee. Also known as a press pot or plunger pot. Frothing milk: Term used to describe how milk is warmed with a steam wand. With the addition of steam and air, milk becomes velvety and thick. Green beans: Unroasted coffee beans. Grind: The size of the ground coffee beans. The ideal grind will vary depending on the brewing method used. Group Head: The section of an espresso machine that holds the portafilter in place when brewing. Hopper: The container on top of a grinder where beans are stored before they are ground. Irish Coffee: Coffee with a dash of whiskey added and topped with cream. K-cup: Name of the coffee pod used in Keurig single cup machines. Kona: A region on Big Island, Hawaii renowned for producing some of the best coffee beans in the world. Latte: Style of coffee made with espresso and topped with steamed milk and a thin layer of foam. Standard size 8-10oz. Latte Art: The pattern formed when steamed milk is poured into a cup of espresso. Light Roast: Lighter body, no oil, often cinnamon in colour. More flavour of origin comes through. Macchiato: Style of coffee made with espresso and a small dash of foam or steamed milk. Literally means “to mark” or “to stain” in Italian. Typically 2-3oz in total. Magic: A style of coffee drink made with a double ristretto, topped with textured milk and served in a 5 oz cup. Medium Roast: Milk chocolate in colour with little oil. More depth of flavour with less acidity. Microfoam: Term used to describe milk heated to perfection with a steam wand to become velvety smooth and thick. Essential for great latte art. Mocha: Style of coffee made with espresso, steam milk and chocolate syrup. Sometimes topped with cream. Non-Pressurized (single walled) Filter Basket: Original style filter basket. Coffee extracted directly into the cup. Quality of the grind and tamp are more important factors to produce a consistent high quality espresso. Organic Coffee: Coffee certified to have been grown and processed without the use of pesticides or herbicides. Piccolo Latte: Also known as a baby latte, is a single shot of espresso topped with milk and served in a 3 ounce glass. PID Temperature Control Technology: Stands for Proportional-Integral-Derivative and is a control loop feedback mechanism that controls the boiler heating element. This mechanism will manage boiler temperature in calculated increments in order to maintain a set temperature. Pitcher: Stainless steel vessel used to froth milk. Portafilter: Device used on espresso machines, typically metal with a plastic handle, that holds the coffee filter basket and attaches to the group head. Pour Over: A brewing method where hot water is poured over ground coffee beans held in a filter that is resting over a coffee cup or vessel. Plunger Pot: Another name for French Press. Pressurized (Dual Wall) Filter Basket: Filter basket with a double base. Extracted coffee is forced through the filter basket into a second chamber with one small hole through which the espresso is extracted. The second chamber creates a greater level of pressure. Commonly found on entry level espresso machines to help improve the consistency of espresso as the quality of the grind and tamp is less important. Puck: The spent coffee from a portafilter. Pull: A traditional term from when espresso machines had levers. Espresso shots are “pulled”. Ristretto: A style of coffee where the espresso is pulled short with less water to produce a stronger more concentrated coffee. Roast: The process whereby green coffee beans are heated to create flavours that are extracted during brewing. Robusta: A species of coffee tree that produces coffee considered of inferior quality. Most commonly used in instant coffee and pre-ground coffee. SCA: Stands for the Specialty Coffee Association, a membership organisation for everyone from farmers to baristas involved in the coffee trade. They also oversee the Certified Home Brewers Program. See the full list of certified coffee brewers here or read our certified coffee maker reviews here. Shot: A single serve of espresso, typically 2 oz. Single cup: Coffee machines that brew a single cup of coffee at a time. Examples include Nespresso, Keurig machines. Single Origin: Unblended coffee from a single country, place and/or farm. Steam wand: The arm on an espresso machine used to heat and froth milk. Pressurised steam is released through the nozzle into the milk. Air is incorporated into the milk to produce textured microfoam. Super Automatic Espresso Machine: A pump driven espresso machine with integrated grinder, milk frother and automatic extraction. See you review of the best automatic machines here. Tamper: Small cylindrical device used to distribute and compress ground coffee into the filter basket. Thermoblock: Heating element used to heat water in espresso machines. It takes water from the reservoir and heats it on demand for brewing or for steaming milk. Typically heats faster than a boiler. Turkish Coffee: Style of unfiltered coffee made with extra fine ground coffee beans brought to the boil often with sugar added. The coffee is served unfiltered – allowing time for the grounds to sink to the bottom of the cup before drinking.